Irish Human Shields To Protect A British Border In Ireland? As fears continue to grow that the United Kingdom is prepared to impose a “Brexit Border“ between the north-east of Ireland and the rest of the country, it is worth noting the more calamitous consequences of an end to the “soft reunification” of the last two decades. Aside from the threat by the UK to abandon its commitments under the Good Friday Agreement of 1998, reneging on its recognition of the Irish and EU citizenship of men, women and children in the Six Counties, the authority of the European Convention on Human Rights, and so on, there is also the matter of free travel between north and south. A renewed “border” means renewed security measures by the British, including a return to “approved border crossings“, the demolition or cratering of “unapproved” bridges and routes, the erection of fortified customs posts, and the paramilitary and military infrastructure to support all of the above. In fact a significant part of the physical paraphernalia of Britain’s counter-insurgency campaign on this island during the 1966-2005 Long War could be brought back into existence. As a reminder of how dreadful that period was, of what decades of foreign military occupation actually meant to those who lived under it, note this. From 1970 to 2005 the security policy of the United Kingdom authorities in Ireland required the premeditated and involuntary use of Irish men, women and children as human shields, as civilian buffers and deterrents, against insurgent attacks by the (Provisional) Irish Republican Army and others. As reported by the Associated Press in the summer of 1992 not only did the UK violate international law during that era but it did so without apology. 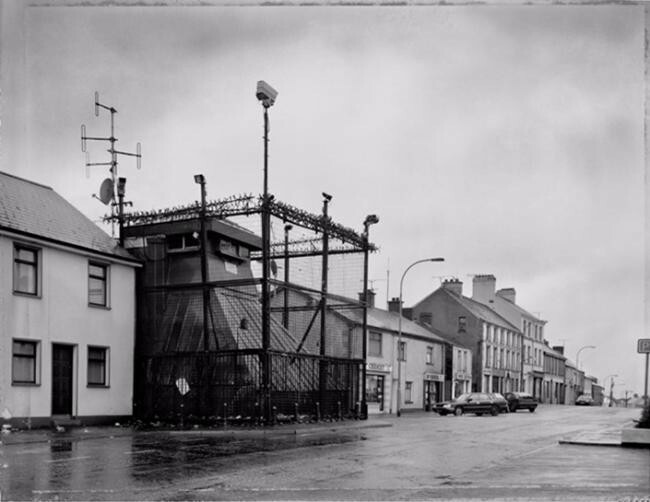 Hundreds of Roman Catholics who live next to British army installations on Northern Ireland’s border believe they are being used as ”human shields” to deter IRA attacks. ”I have become their front line of defense,” said Kathleen Rutherford, who has watched with trepidation as an army post has grown around her home. Such fears were brought into focus last week when the British government agreed to move a Catholic primary school away from an elaborate army post being built on the main Dublin-to-Belfast road outside this town. The decision broke a longstanding policy of not addressing residents’ worries about their proximity to likely targets – and came only after the Irish Republican Army fired homemade mortars at the construction site. The attacks have left nine soldiers dead and wrecked scores of homes. The army’s response has been to dig in deeper and expand the bases. The IRA blasted an army post south of Newry in October 1990 and again in May. The second blast killed a soldier. The army’s top brass decided to build a bigger post up the road – coincidentally, they said, nearer the local school. Residents, most of them Catholic nationalists who would like to see the army leave altogether, sent a delegation to the government. ”I asked the British ministers, who’s guarding whom?” said Kevin Campbell, headmaster of Cloughoge Primary. Residents threatened to take the case to the European Court of Human Rights, and parents vowed not to let their children return Sept. 1 if the facility was not moved. … Jeremy Hanley, one of three government officials who met with the angry residents, denied that the decision meant the youngsters were in any danger. He accused the IRA of exploiting parents’ fears. On the road heading north from Londonderry, Rutherford braces for an IRA attack on the expanding army base next door. She moved into the house five years ago when the army presence was little more than a tower and gate that monitored passing cars. ”Now look at it. It is a monstrosity on my doorstep,” she said, gesturing out her back window at the anti-bomb trenches, barbed wire, searchlights and watchtowers that have sprouted up in the past few months. …army engineers and an extra battalion of troops have overhauled the string of checkpoints into full-blown patrol bases, seizing farmland in the process. ”This is the sort of tactic which was resorted to by Saddam Hussein in the Gulf War,” the newspaper argued. ”It is the scourge of terrorism that places people in jeopardy, not the army, who are trying only to keep the peace,” said Mates. If London is faced by a direct challenge to the reinforcement of the British-imposed partition of this island nation, can there really be any doubt about it employing the same tactics and strategies as used before? That is the real and very physical threat posed by the “Brexit” border to the people of Ireland. I seriously doubt that it would return to this. I also doubt that the UK with genuinely leave the EU. There was no referendum to JOIN the EU, so what makes anyone think the UK’s membership is valid in the first place?